Nice rainstorm this week at Burlingame Intermediate School . . . Looking forward to attending the Greenbuild Conference in Los Angeles on Wednesday, October 5 . . . 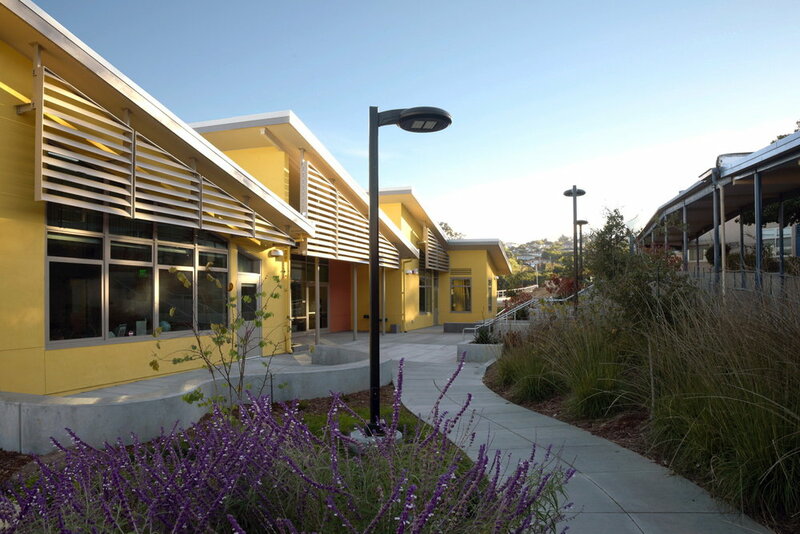 The Burlingame Intermediate School Classroom Building delivers a vision for a twenty-first century learning facility that supports this school district’s concept for delivering education, and resolves the physical challenges of a sprawling campus. Stakeholders spoke of creating a “heart” for the school, campus and community, which is achieved by enclosing a previously amorphous space to create a new quad. The building is a bridge to the other parts of the campus, physically linking upper and lower campuses, and surrounding pathways are furnished with nooks and seating for socializing, with opportunities for engagement and discovery. Outdoor learning opportunities play an important role in the curriculum and the building includes a variety of opportunities for different activities. On the south side, new trees will shade outdoor learning spaces. The design maximizes natural daylighting, while minimizing glare and solar heat gain. Windows and clerestories bring in abundant north light, while deep overhangs and fixed sunshades screen classrooms from direct light.